Among the last real Roman trattorie with an Italian in the kitchen and a serious pizza maker turning out the best in the Campo district. 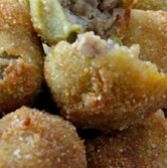 The antipasto rustico of fried fiori di zucca, ulive ascolane, supplí, and potato dumplings is a light meal in itself along with one of the trattoria’s famous salads. Very reasonable. Reservations a must in summer.